We’re nearing the end of our Digital Life unit, and yesterday, our topic was cyberbullying and bullying, in general. It was a deep conversation across my sixth grade classes, rich with questions and insights and, unfortunately, experience. One of the topics we discusses is the role of the bystander, and as luck would have it, I came across this activity/event in my National Writing Project network. It has to do with thinking through and understand the role of the bystander who takes action. The term is a bit odd to say — upstander — but I had my students write down what they thought it meant before we talked about what it meant. 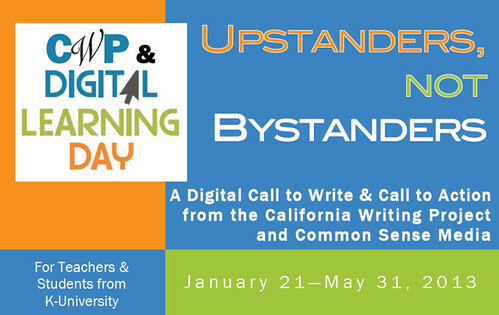 Some of those notes have become part of this presentation that I will be sharing with my students and families, and also, submitted to the Upstanders, Not Bystanders event. This also reminds me a presentation that I gave at last year’s NCTE meeting around cyberbullying (thanks to the invite by Kylene Beers). I’ll share it here, too.